It’s no secret I’m obsessed with my slow cooker. There’s a reason I published a Cookbook full of easy and healthy slow cooker recipes. I can’t get enough of it. I’ll even go out on a limb and say a slow cooker is the most essential kitchen tool for busy moms. Seriously. 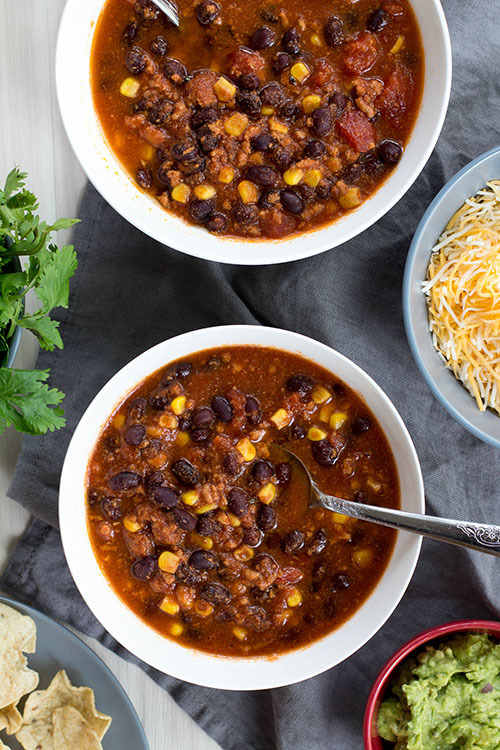 When you’re short on time or energy to make dinner, your slow cooker is your best friend. Cook fresh or freeze to cook later. Serve with shredded cheese and chips! Break apart turkey and stir. Cook on “low” setting in slow cooker for 6-8 hours. Break apart ground turkey and stir. What’s one meal that you’d love to be able to make in your slow cooker? 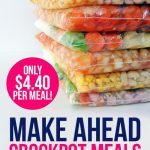 Leave a comment or email me and I’ll try to make it slow cooker-friendly! Hi! 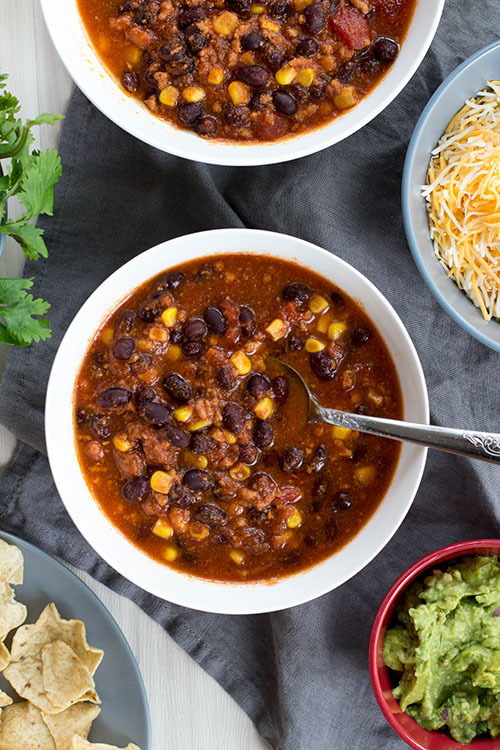 This looks great…could you throw this all into a freezer bag after step 3 and freeze for future crock pot cooking? I would love to add this to my freezer exchange if so! It freezes great! I do steps one and two, cool the turkey to room temp, and then combine everything in a gallon-sized plastic freezer bag. Thaw in the refrigerator overnight before cooking and then cook in the crockpot for 4-8 hours, or until everything is heated through (depending on the size/strength of your crockpot). Hope you love it as much as we do! 1.) 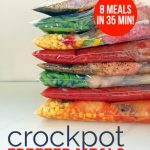 What size crock pot do you use for this recipe? 2.) Do you stir everything up once it’s in the crockpot, or layer it and don’t stir? 3.) How many months will this keep in the freezer if you prep it as a freezer meal? I typically use my 4-qt slow cooker. If I used my bigger, more powerful 6-qt one I would definitely decrease the cooking time. Yay!! GREAT JOB. Can’t wait to see what you think of those recipes too! Stupid question. When you say tomato sauce are you talking about Ragu or like a pasta sauce? Just wondering. I need to be a more organized Mom. We are very busy. It’s sold in the canned tomato section. They sell a bunch of different types of canned tomatoes, like diced, crushed, pureed, etc. Tomato sauce is one option. Hope that helps! I don’t think I’ve ever seen a 24 oz. can of tomato sauce. Is that correct? No, it’s a typo. It should say 28oz. Changing it now, thanks! Four adults. Six people might be able to eat it if they’re children or have smaller appetites. Do you think I could make this without cooking the meat ahead of time and just putting it in raw and freezing it? Yes, I done it several times that way. I used to brown my ground meat before freezing, but I’ve found it’s unnecessary and only takes more time. 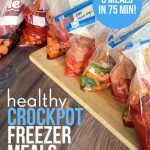 I had the same question – is it healthier / safer to cook the meat, freeze, thaw then put in crock pot? Or just freeze it raw and let it cook in the crock pot? Kelly, we always freeze it raw.